Question: What is the outcome of today’s lesson? Answer: We are entering a new epoch. We stand before the necessity to change our mutual relationships, at the transition from egoistic competition to mutual guarantee, and after, to universal love. At first this occurs forcibly, under the influence of our current state and the pressure of nature, but then we will willingly shift towards mutual concessions and mutual concern. In accordance with this, we need to build our system of explanations, education, and upbringing in such a way that over a long time it would be exerting an influence on an individual, on groups, on society, people, a nation, and on all countries together, until gradually, we all receive one upbringing and learn to live happily all together in our one home. Question: In the “Introduction to The Study of the Ten Sefirot“, Baal HaSulam says that every person will go through spiritual states. Does this concern only people with a “point in the heart” or actually everyone? Answer: Everyone must reach the end of correction, Gmar Tikkun, everyone. The question is, when? In what order? After whom and before whom? It says: “For they shall all know me from the smallest to the greatest.” “For my home shall be called a home of prayer for all the nations.” Could it be that a certain desire to receive will remain uncorrected? Will the general and absolute end of correction of Malchut of Ein Sof come? The whole difference is in our participation. There are those who pull all of humanity after them, half or a quarter of…it is the same as with Moses during the exile from Egypt who, according to Jethro’s advice, divided the people into tens, hundreds, thousands etc. in order to direct them to correction. An African living on the Savanna will also reach correction, if not now then in a few more reincarnations. He too will have to go through all the spiritual states. In your imagination he is hunting an antelope now, but if you look at him differently, you will see that it is a spiritual vessel that is going through certain states on the way to more serious correction that are felt consciously, you wouldn’t see a corporeal picture but a desire to receive. Even now he is in the process of correction and is reincarnating, but it is unconsciously. This process includes everyone, but each one in his own way. Therefore, we don’t criticize anyone. A person himself determines the way he feels his world and his cooperation with others. We are all different, and each has his own portion, his own combination of the spark, the Light, and the desire. Question: Can anyone take an active part in the process? Answer: Even a slight action is enough for someone to express the activity. Imagine that you were born a prince, and a great mission is waiting for you. Accordingly you are educated and taught, but you perform your mission by 80%, while an ordinary camel washer invests 100% of his internality. Therefore, the camel washer will reach the end of correction, will rise to the level of righteous, will receive and will feel everything, while you will have to work, although speaking in specific spiritual terms, your corrections are much greater than his. Each one is measured according to his desire to receive, and in it he determines his level. The spiritual ladder is in our spiritual vessel. Question: Today, scientists are discovering that we are all interconnected, that countless threads, which we never even knew existed, stretch out between us. How does a Kabbalist see this? Could it really be that this enormous tangle moves constantly before his eyes? Answer: In reality, everything is very simple. And the further we advance, the simpler it is. Man is simple, and the Light is simple, while the multiple calculations arise because egoism interweaves with the desire to bestow. The further a person progresses, the more naturally he perceives the picture of the world. Habit becomes second nature. The same way you view your family and loved ones: It becomes your life, your nature, and you no longer exert efforts in the relationships with your loved ones or those whom you don’t really know. You know each of them and understand all the connections. Right now it seems to you like a problem because it requires efforts. But when the desire to bestow reigns within you, problems disappear. There’s nothing simpler than coming to know the spiritual world and living in it. You don’t need to control anything since all of it is revealed within you, as your own system. And this is why each subsequent degree will be even freer from pressure, from the necessity to understand what’s happening. With every step, everything will become only clearer. 2. While I, in accordance with my desires, can call myself either the “wicked” or the “righteous,” depending on whether I justify this state or not. Moreover, which criteria do I use to justify it? If it is pleasant for me, then of course I justify it. What am I in this case then: the“wicked” or the “righteous?” I am the wicked because I justify the Creator egoistically. It could also be the opposite: My state is evil for the will to receive and good for the will to bestow since it allows me to move forward. It turns out that the Creator is helping me by sending a bad sensation so that I don’t remain in the same place and instead realize that there are still things that require correction in my relationship with Him. True and precise self-evaluations are always needed. Everything depends on a person who attains the given state, analyzes it correctly, and comes to a demand. And what does he demand? He asks for the forces of bestowal, and nothing more. If I ask for good, this demand will be egoistic. At the same time, I am not able to ask for harm to my egoism. The very same ego lurks in any such request. How can I beg to progress to the next state, which undoubtedly bodes harm for my egoism? Could I really ask the Creator to correct me, that He take away the most precious thing I have right now? If in my current desires I yearn for pleasures, how can I ask to stop receiving pleasure? It won’t be an aspiration of the heart but simply words that don’t count in spirituality. A person has no possibility to raise a prayer for correction on his own. 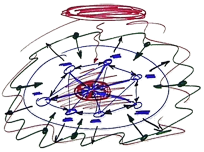 The only way is to appeal from within the point in the heart (without attaching anything from my own self since egoism reigns within me) by connecting to the group at the same time. Only together with the friends can I make my contribution to the common prayer for correction. And this prayer will help us. Question: All of us, men and women alike, are looking for ways to ascend to the next degree. How can a woman come to the correct understanding of it? After all, the men unite and discuss these questions in the groups, while a woman doesn’t participate in this process? Answer: A woman is the vessel that a man needs to fill with his work towards the Creator. What does he fill this vessel with? With the Creator. Here a man acts only as a means. This is what we call a screen and the Reflected Light. This is the men’s work. And the women’s work is an enormous desire for the revelation of the Creator. So where do you see a small role of a woman if she is actually the very desire without which a man has nothing to do? This is why unmarried men were never accepted into Kabbalah. What’s there for him to do if he doesn’t have a wife? This is called “half a body.” There is such a concept in Kabbalah: An unmarried man is half a body. With only half a body you shouldn’t be coming to study. This is why we need to understand what the role of a woman is.